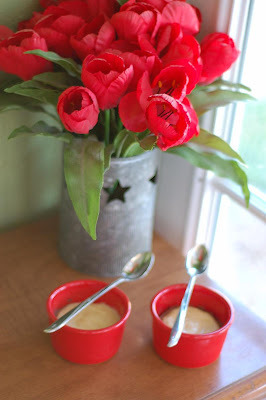 Anne Strawberry: Split Level Pudding and a giveaway! This pudding is so good that I feel like calling it pudding isn't enough. It's more than a regular vanilla pudding- it has a surprise chocolate layer, it's silky smooth, and with a few changes, I don't even feel that bad eating it. I replaced the whole milk with 2 percent, used "cashew cream" in the ganache (a mixture of raw cashews and water, blended until it resembles heavy cream), and omitted part of the butter. You won't notice the changes but I think you'll enjoy this delicious and easy dessert- with less guilt. Even so, I did feel a little guilty eating the extra pudding for breakfast. But sometimes you need something quick, you know? And with my little red ramekin was staring at me from the fridge, I went for it. So this brings me to the giveaway from MyBlogSpark. These Nature Valley Granola Nut Clusters are delicious and come in a flavor everyone will like. My husband loves these and that's a pretty glowing review since he's a serious snacker. This prize includes all the flavors of nut clusters (the roasted peanut is my favorite) and a few other goodies (you can bet my son already grabbed that flashlight and is napping with it as I type this!) If you'd like to try these, you can grab a coupon here. Giveaway will end Sunday night (10/11/09) at midnight, AZ time. I'll randomly choose one winner (US residents only for shipping purposes). Please make sure you're profile is linked to your blog or email or something so I can get a hold of you! Bring the cream to a boil, pour over chocolate and let sit for 30 seconds. Stir gently to blend and divide mixture between the pudding cups. Set aside. In a glass measuring cup, boil the milk in the microwave. Meanwhile, combine sugar, cornstarch, salt, and egg yolks in a medium saucepan. Whisk until combined. After the milk boils, slowly pour a small amount into the saucepan while whisking. Continue whisking and drizzle in the rest of the milk. Once thoroughly combined, place over medium heat and keep whisking until the pudding thickens and starts to bubble (two or three minutes). Meanwhile, melt the chocolate in a metal or glass bowl set over saucepan of simmering water until smooth. Remove bowl from heat and cool slightly. Stir in cashew cream until well-blended. aww..I love nature valley trail mix bars..
anyway, even if I can't enter the giveaway I'm gonna tell you what my fave snack is: I love snacking on anything really: fruit,chips and cheese sticks!!! I really want to try the cashew cream. What a great reason to make more pudding! I'm a Canadian, so can't enter your giveaway, but want to offer that my favourite snack is a couple of squares of 70% chocolate - simple and perfect. The idea of cashew cream is very interesting. Is it a lot fewer calories than cow's cream? Can you taste the cashews at all? Have you tried almond milk and is it something like that? I will investigate more. My new favorite snack is a Honeycrisp apple with Barney Butter! Yum, cashew cream! That looks and sounds delicious! My favorite snack is either an apple or carrot sticks. Both with peanut butter. honeycrisp apples are my favorite fall treat right now! I'm so happy to see you back! I want to see pictures of that adorable baby though! Sounds great! And what a great giveaway. I've been wanting to try these. My favorite snack is a handful of unsalted cashews with a kashi oatmeal & chocolate cookie. Nice healthful changes - and glad to see that it worked out nicely for you. My favorite snack is crispy salami - bake slices of salami in a 400 degree oven until they are crispy. The kids love them too! I wish I had a really healthy snack to share. I just love anything cheese. I am really interested in the cashew cream. I remember seeing you use it before. Your puddings look delicious. How lucky that your baby cooperated! I love nature valley granola bars. My favorite snack is cheese and crackers. Love your photos! Your pudding looks great too. My favorite snack is either an apple with peanut butter or yogurt with a tablespoon of almonds. I am serious snacker, even though if forces me to spend more time on the treadmill! My favorite snack involves pretzels. I love chocolate covered pretzels. I love big soft chewy pretzels, you know like the ones from the mall but I have a great recipe to make them at home. And I really love butter snap pretzels, they are awesome with whipped cream cheese. Vanilla ice cream, hands down. My favorite snack varies....I like to keep craisins in my drawer at work for a mid-morning snack. I also love chocolate chewies from Safeway. Yum! Cashew nuts. Wonderful. Love those and i can understand how they would add the little something special to the pudding. (Altho mine didn't work out) yours are perfect. my favorite snack is crackers...I don't know why but I love to stack them up and nibble on them while I watch tv. The pudding sounds delish. My current favorite treat is Paradise Bakery Chocolate Chippers, but two quick easy standby are raw almonds or snap peas. Wow, the cashew cream sounds really interesting and I bet it adds a great nutty flavor to the pudding! 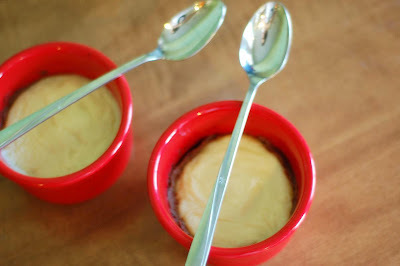 Your Split Level Pudding looks nice, smooth and creamy! My favorite snack is peanut butter on graham crackers dunked in milk. It is even better when my kids are joining in and I steal a little bit of their whole milk to dunk my crackers in! I still haven't tried those clusters and really need to, granola is one of my favorite things. One of my favorite healthy snacks is yogurt with fruit and granola on top. I find it hard to please my husband with his snacking/hunger--he'd rather have savory than sweet. What a lovely job you did with this pudding! I love your red ramekins too! I make a vanilla cream that is similar to this and I love it with bananas or with rice. I LOVE rice pudding and really wanted that when I was pregnant. Luckily it is very easy to make! Cashew cream? Could it get any better? I love Red Vines, Chocolate covered pretzels, apples, grapes, anything really. I love snacks. I love all treats, but right now with halloween approaching I've been snacking on candy corn. I like the autumn mix where has a little bit of chocolate and pumpkins too. mmmmm..cashew cream sounds SO delicious!!!! I love pizza bites. I buy bisuits in a can in the refrigerated dough section. I then smash all 10 biscuits to small mini pizza sizes. Then put pizza sauce and add toppings! Great for snacks or even for parties. I like the changes you made to the pudding. My fave snack is grapes. I too am a pudding lover homemade or otherwise. My husband hates the texture, so I don't make it often. But I might just make this and enjoy it with my girls and leave him out!